2013 is going to be the year of the budget quad-core Android smartphones. Lots of such phones are coming out everyday. Zen recently launched the Zen Ultrafone 701 HD which is a quad core Android phone priced at less than 12K INR. But even though it is cheap in price, the specs and features are pretty good. Zen Ultrafone 701 HD sports a 1.2GHZ Quad Core, 5 inch screen, 8MP camera, Android 4.2 Jelly Bean OS etc. 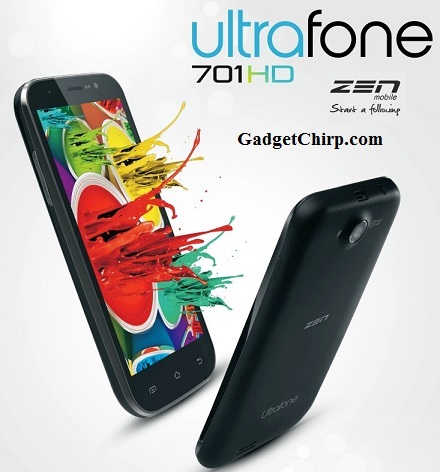 The detailed specs and features of Zen Ultrafone 701 HD are given below. The price of Zen Ultrafone 701 HD in India is 11,999 INR and it is available for pre-booking online retail shop Snapdeal.